We have created a set of fabric educational toys to help teach little ones about Pascha. They complement our Pascha teaching material and can be used at home or in class as a hands-on enrichment experience. It is a collaboration with St. Tabitha’s Workshop, an Orthodox creator focusing on fabric items. Please CLICK HERE for more information. The central point of our Faith, the glorious Resurrection of our Lord – celebrated on Pascha Sunday – cannot be separated from His Passion, which we commemorate during the Holy and Great Week. It is a complicated topic to teach, especially to young children (PreK to early Elementary), and we usually work on it for at least two sessions, as there are many important details and events to be considered. When teaching about Pascha, we have tried different approaches. In this resource page, we are exploring a lesson that uses four specific icons as teaching tools. These are: the Extreme Humility, the Epitaphios, “He is not Here”, and “Touch Me Not” (for details about the icons see the Background section below). When used in sequence, they form a natural visual narrative which is very easy for even the youngest children to follow. We have purposely not included the most common Resurrection icon, the Harrowing of Hades, also known as The Descent into Hell. We usually deal with it separately, as it explores difficult concepts and is often hard for the children to grasp as part of the sequence of events of our Lord’s Passion and Resurrection. In the future, we are planning on devoting a resource page specially to this very important icon. Put the four icons in order, briefly describing the sequence of events. Name the main characters in the icons: Jesus Christ, the Theotokos, the Angel, Saint Mary Magdalene. Define lighting the Pascha candle and cracking the red eggs as traditions signifying our Lord’s Resurrection. Recite the Paschal greeting: Christ is risen – Truly, He is risen! Point to and describe the main details of the icons: The Cross, Our Lord’s wounds, Christ’s tomb. Explain that, during Holy week at church, we relive the events of our Lord’s Passion and Resurrection. Describe the Sepulcher and Epitaphios as a representation of Christ’s Tomb and name the Lamentations as the funeral hymns for Christ. First, we would introduce the story using the paper puppets. If we had time, we would ask some of the childen to act out what we just showed them, with the help of the puppets. At the end of the introduction, we would show the real icons and ask the children to identify the persons and details. Then, we would do the printed activities: number the details in the pictures (for the older children), put the scenes in order (for everyone). One of the craft activities would follow: offer flowers to the crucified Christ or decorate the Epitaphios (or both if time and interest allowed). At the end, we would play the following game, which has been very popular in our classes. It can be also played non-competitively by only one child. “Put the scenes in order” page #2, printed from our printable package above, as many copies as there are teams. Plastic Easter eggs, four eggs for each playing team. Ahead of time, print and cut out the scene pictures. Insert each scene picture inside an Easter egg. Assemble as many sets of eggs as there are teams. Each set should consist of four eggs in total, each egg containing a different scene. At game time, distribute the sets of eggs among the teams. When you say GO!, each team opens up its eggs and tries to put the images in the correct order. The first team to complete the task wins. Christ was betrayed by Judas, arrested and led to the Jewish authorities who accused Him of blasphemy and condemned Him to death. Our Lord suffered mocking, spitting, and blows from the Jewish authorities, who then took Him to the Roman governor, Pontius Pilate, to execute His death sentence. For many hours Christ was tortured by the Romans, before He was finally condemned to death. It was Friday noon when our Lord was crucified between two thieves. At 3pm on Friday Christ died on the Cross. A Roman soldier pierced His side – blood and water came out. Before He died He asked the Father to forgive them all “…for they know not what they do” (Luke 23:34). Two Pharisees and secret disciples of our Lord, Nicodemus and Joseph of Arimathea, took down His Body, wrapped It in linen with myrrh and spices and put It in a new Tomb. Only the Theotokos, the women disciples and John the disciple stayed with Christ until the end – all the others had abandoned Him. The Theotokos and the Myrrh-bearers lamented over our Lord’s lifeless Body. When Christ died on the Cross, He descended into Hades to fight Death and his power over human beings. We celebrate this on Holy Saturday. Early in the morning of the third day (Sunday), Christ rose from the dead. He left His burial clothes in the Tomb, intact. The same day before dawn, the Theotokos and the Myrrh-bearers went to the Tomb to anoint Christ’s body with myrrh. They saw the big stone rolled aside, the Roman soldiers fainted, and an Angel sitting next to the Tomb. The Angel told them that Christ was not there – He had risen! The Angel showed them the empty Tomb. Saint Mary Magdalene was the first of the Myrrh-bearers and the disciples to see the Risen Christ. When she recognized Him, she kneeled down to kiss His feet but Christ prevented her – “do not touch/cling to me, for I have not yet ascended to my Father…” (John 20:17). Saint Mary Magdalene ran to tell the glorious news to the other disciples – they didn’t believe her or the other Myrrh-bearers, until they saw the Risen Lord themselves. The Twelve Gospels of the Passion of our Lord and Savior Jesus Christ, read on Great Thursday evening. The Anastasis (Resurrection) Gospel of Pascha Sunday, read at the Resurrection Vigil of Great Saturday night. In Orthodox iconography, the actual moment of the Resurrection of Christ is never shown, so the image of Christ victoriously rising from the grave holding a flag – which is popular in the West – is not an Orthodox visual theme. The Orthodox Pascha icons only depict events that were actually witnessed and passed down, and neither the Gospels nor Church tradition describe the moment of Christ’s Resurrection. Two Orthodox Pascha icons not depicting a witnessed event are the Extreme Humility and Descent into Hell; instead, these icons visualize Orthodox theological truths. The Epitaphios is an embroidered and richly adorned cloth, depicting the dead body of Christ, often accompanied by the Theotokos, angels, and other figures. On Great Friday, prior to the service of the Apokathelosis – the special Vespers service commemorating the Un-nailing of the Precious Body of Christ from the Cross – the Epitaphios is placed on the Holy Table. Near the end of the Apokathelosis service, the Epitaphios is taken from the Holy Table and placed inside the wooden Sepulcher, which represents the Tomb of Christ. Usually, on Great Thursday night or on the morning of Great Friday, the Sepulcher is richly decorated with flowers. The faithful venerate the Epitaphios, and follow it on a large funeral procession that takes place on Great Friday evening. This icon of the Resurrection of our Lord is described in all the Gospels, with few variations. It shows two or more Myrrh-bearers – usually including the Theotokos – looking at the Angel who is sitting next to the Empty Tomb. Sometimes we also see several Roman soldiers lying on the other side of the Tomb, as if fainted (Matthew 28:4). This icon shows the appearance of the Resurrected Christ to Mary Magdalene, the first of the Myrrh-bearers who saw the Risen Lord. This icon type is relatively new, it emerged around the 16th century. In many variations, St. Mary Magdalene is shown without a head covering, which is unusual in Orthodox iconography: this is considered a Western influence. Christ can appear in His regular blue/red clothes or, most often, in His glorious white/golden clothes, the way He is usually depicted after the Resurrection. On icons of the Resurrection, Christ is also surrounded by a mandorla, an almond shape that symbolizes His majesty, glory, and divinity. Rarely, this shape can be found on variations of the “Touch me not” icon. 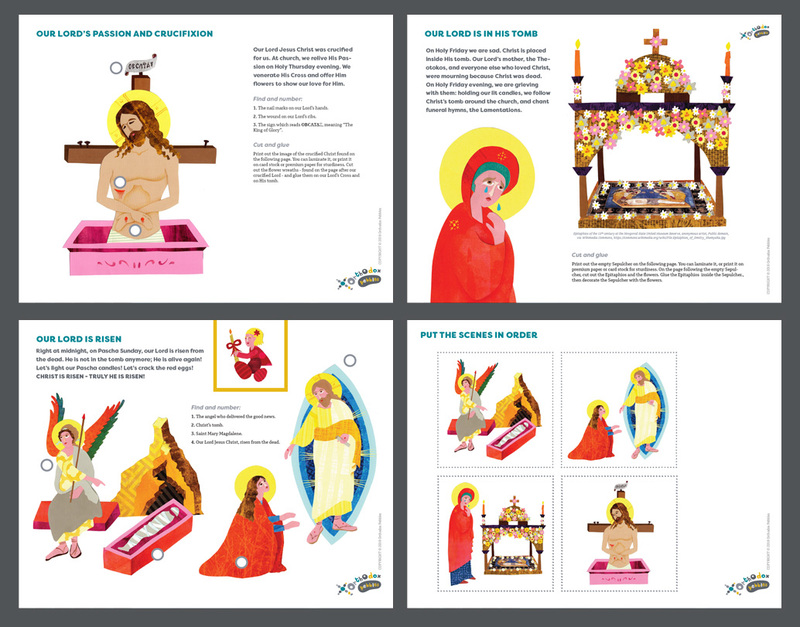 We chose to use it in our illustrations, to make the concept of the Resurrection more obvious for young children. Coffee with Sister Vassa video, Episode 27, Easter/Pascha. For more, please visit: CoffeeWithSisterVassa.com. Journey to Pascha, a daily guide through Holy Week, booklet from the Greek Orthodox Archdiocese in America. Suffering and the Crucified Christ, by Fr. Emmanuel Clapsis, Greek Orthodox Archdiocese in America. The Orthodox Celebration of the Great and Holy Saturday, by (+) Fr. Alexander Schmemann. He Is Not Here!, by Fr. John Breck, Orthodox Church of America. The Lamentations Service for Holy Saturday Matins. Touch Me Not, The Extreme Humility, and The Place of the Theotokos in Icons of the Resurrection, from A Reader’s Guide to Orthodox Icons. Within a Mandorla, by Fr. Stephen Freeman, Ancient Faith blog “Glory to God for all things”. Special thanks to Y2AM and Sister Vassa Larin, for allowing us to embed their videos into our page.